Susanne is the daughter of Hungarian refugees who settled in Sydney, a sole parent of two children, a multiple cancer survivor, and an award winning children’s author. She is committed to inclusion and literacy through her books and as a speaker. She has spoken across the world from indigenous kids in outback Australia, schools in the Pacific island nation Kiribati, on an ‘I Am Jack’ tour across the USA, to the IBBY Congress in New York. Susanne is committed to the children's book community as a Writer Ambassador for Room to Read, Patron of Monkey Baa Theatre, Ambassador for the Premier’s Reading Challenge NSW, Australia Day Ambassador, head of the Society of Children’s Writers and Illustrators (SCBWI) Australia East & New Zealand, former chair of the board of the NSW Writers Centre and other organisations. Susanne was awarded the Lifetime Social Justice Literature Award for her body of work by the International Literacy Association and awarded an Order of Australia. Susanne is recognized for her youth literature and writing on social justice. Susanne’s young adult Butterflies is acclaimed as an Outstanding Youth Literature on Disability, while her picture books Elephants Have Wings, Ships in the Field and Gracie and Josh are recognized for their engagement with disability, inclusion, multiculturalism, war and peace. The I Am Jack books have become rite-of-passage on school bullying and have been adapted into an acclaimed play by Monkey Baa Theatre. It continues to tour Australian and US theatres. An award winning short story writer, her stories sit alongside David Malouf and Thomas Kenealley. As Italians living in Egypt, Anna's whole family were forced to flee with only their suitcases during the Suez Crisis. Anna's father, mother and sister were deported to Italy, where they were to stay for two years alone and in dire circumstances. They were lucky that Australia accepted them. They came by ship to reunite with other family members, and create 'home' in a new field. Anna was born in Australia. 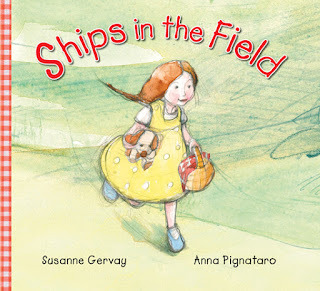 Her illustrations in ‘Ships in the Field’ honour her parents’ journey. Anna is an award winning illustrator and writer-illustrator of picture books, with more than sixty books for children. She has won the Crichton Award for Book Illustration and The Children’s Book Council awards. Anna’s books have featured on children’s television programmes such as Play School, Humphrey and Warrawy, are published internationally and translated into eleven different languages. She is also the author of a junior fiction series and has created a quirky and diverse range of greeting cards. Books Anna has illustrated include: Ships in the Field, Elephants have Wings, Too Busy Sleeping, Little Red Riding Hood, Beauty & the Beast; and books she has written and illustrated include: being Agatha, How I love You series, Princess & Fairy series, Our Love Grows and more. Told through the eyes, perception and narrative voice of a little girl, we learn that her beloved, funny Papa works in a car factory but used to be a farmer “in the old country, before it was broken”; and quiet, withdrawn Ma, who seems to have forgotten how to smile, was a teacher and now “sews dresses all day long”. The girl’s confidante is her soft toy dog Brownie but she also longs for a real dog. Every Sunday the family goes into the countryside and Papa says, “Look at the ships in the field.” This makes the little girl giggle, for it conjures up a funny image, but it makes her sad too, because other people laugh at the way her father speaks – and so she stands up for her father, singing with him in his mispronunciation of the word “sheep”. One Sunday, near the “woolly ships”, she finds something very precious that signals a new chapter for all the family. The girl’s parents keep their background and war secret from the girl to protect her, like many parents. However, children feel their parents’ worries. She confides in Brownie, “I don’t like war.” Anna Pignataro’s beautiful watercolour illustrations with their rough pencil outlines, capture the emotions – love, pain, joy – that emanate from the story. As well as the ever-faithful Brownie, vignettes of a real dog appear throughout the story. It was a personal journey where I wanted to share the stories of my parents and growing up in Australia. My father Zoltan made paper hats from the serviettes. My mother Veronika made chicken soup every night because it was good and from their old country Hungary. Papa had the biggest laugh that made his moustache quiver. I would slip into my parents’ bed when I was scared at night. 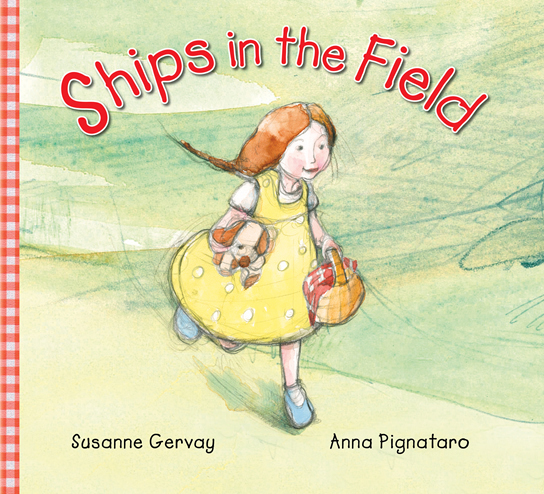 Anna Pignataro the illustrator also wanted to share stories of her family. ‘Ships in the Fields’ was a testament to our parents and those who had been through war and had the courage to make a new life in Australia. It was also to give a safe and soft way for grandparents and parents to share their past with their children. There have been so many emotional responses from ‘Ships in the Field’ where adults said it was their story too and where young people opened discussion with their families. I found it sad that refugees/immigrants who speak broken English mixed with their birth language, face derision. My parents spoke – Hungarian-English – Hunglish. Sometimes people thought my parents weren’t smart because of it. They spoke loudly to them, like they were deaf so they could understand. They couldn’t get work easily or could only get work like cleaning and manual labour. My father had been a farmer and successful trader in Hungary and my mother the daughter of a Professor of Engineering in Budapest. They weren't easily included in the community. It hurt me. It hurts children whose parents come from other countries and speak broken English. However, they were accepted in the end and they loved Australia with all their hearts. I discovered that the coffee my father boiled on the stove, was Turkish coffee. It originally came from Ethiopia in the 11th century and then went through Arabia and Turkey. Through the Ottoman (Turkish) Empire that invaded Hungary, the Turks brought this coffee. That’s why my father made Turkish coffee which he loved and it became part of the story in ‘Ships in the Field’. Intriguing how an author's personal family stories contribute to a national culture.